Every woman who has ever tried hair coloring longs for the after-dye shine and intensity to last forever. Unfortunately, with time your color tends to fade. But a few clever tricks might help you prolong the effect! When you find yourself in front of a shelf packed full of various dyes, make sure that the one you choose is of top quality. Do not rely on the brand entirely – check the ingredients; the lower ammonia content the better. The best dyes also condition as they color, so look for the products with added nourishing extracts. 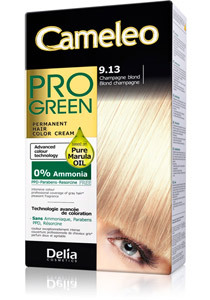 Cameleo Pro Green hair color cream is ammonia free and contains pure marula oil which takes good care of your hair and leaves it healthy-looking and shiny. Every time you shampoo your hair the color gets a little bit less intense. That’s why it’s so important to choose the right hair care products. The more artificial ingredients the product has, the more harmful it will be for your hair – and color! Watch out for the products that have smoothing, straightening, and curl-enhancing properties. They tend to have more ingredients that might speedup the fading process. You will achieve best effects if you choose a special color-protecting hair care line. Cameleo BB products for colored & bleached hair are enriched with keratin and don’t contain parabens, colorantsor salt, which might destroy hair’s natural protective barrier and cause faster discoloration. Remember that after coloring your hair you should avoid excessive exposure to sunlight, because UV rays can penetrate the cuticle of the hair and bleach the color. 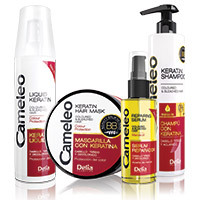 Cameleo BB products for colored &bleached hair are specially designed for UV protection. The built-in ingredients prevent the sunraysfrom destroying the surface of the hair and ensure the rich color for a longtime! Unfortunately, after coloring hair tends to get dry and that’s why you should deep condition it moreoften. Apart from regular shampooing and conditioning we would advise you to use a mask at leastonce a week. Cameleo BB Keratin Hair Mask for Dyed and Bleached Hair deeply nourishes your hairand leaves it soft and smooth. It’s also another step in your color protection. Just like Cameleo ProGreen Color Cream, Cameleo BB Keratin Hair Mask for Dyed and Bleached Hair contains precious marula oil which is known for its nourishing and beautifying properties. These three little tricks will help you enjoy your shiny and glossy color for a longer time. Just devote extra few minutes to your hair care.